Attic bedrooms are often hot and uncomfortable. Frequently part of an older home and finished as an afterthought, they usually are small by bedroom standards and lack their own closets. 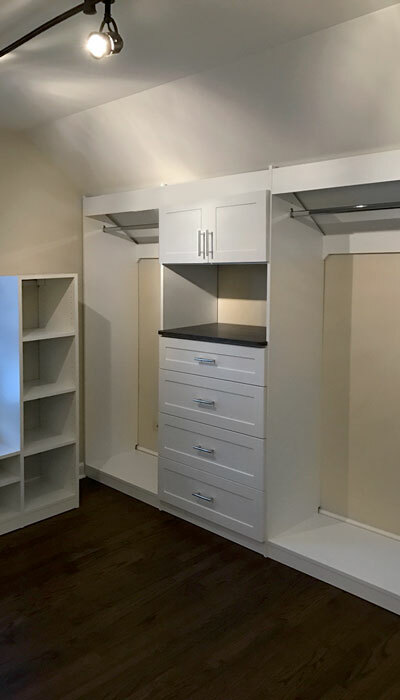 If you don't need the extra sleeping space, they are the perfect candidate for a bedroom to closet conversion. 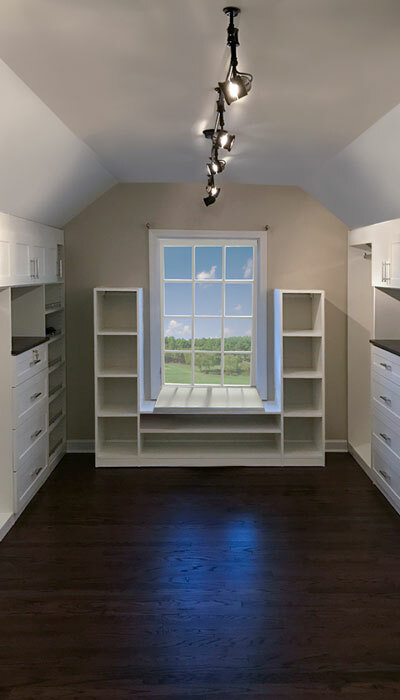 The owners of this vintage home decided to do just that with this space, solving the storage crunch in their historic bungalow with this new attic clost. The geometry of this room is not standard — the ceiling slopes at hexagonal angles and is quite narrow. Attic spaces always present challenges. The key in designing a great closet is to turn the challenges into assets. White laminate was chosen to blend with the painted woodwork used throughout the home. Rather than remove the window and fill the only "straight" wall in the room with more hanging rods, the owners chose to work with the window opening — ensuring that the space could later be used as an office or bedroom again by a future homeowner if desired. 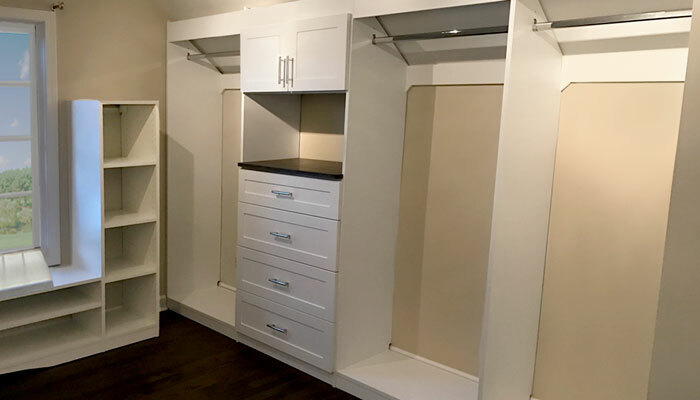 A shelving unit that frames the opening, and also serves as a custom bench area to put on shoes and socks, was constructed to maximize storage potential. 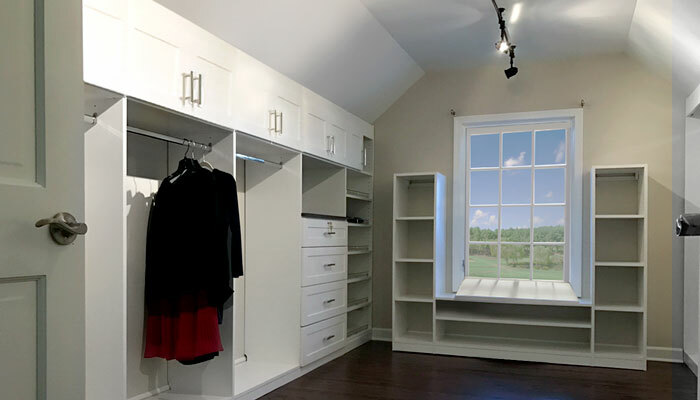 It allows natural light into the room and serves as a unique focus to the space while providing storage for shoes, purses, miscellaneous boxes and bags. The custom cabinets were built with an angled top to fit snuggly against a knee wall. Special closet rods brackets were installed that are specifically designed for hanging closet rod from sloped ceiling. 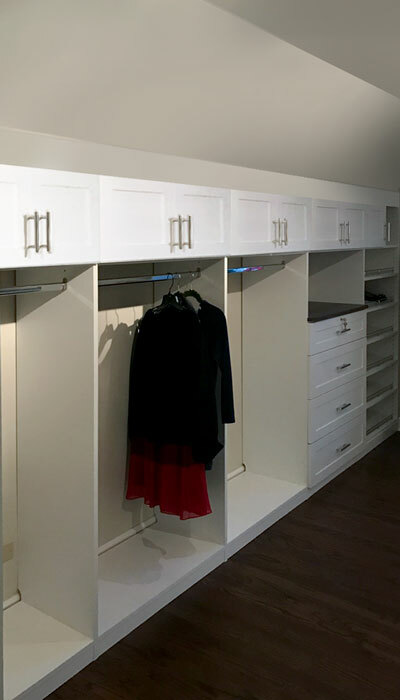 The resulting hanging areas were too short for the usual double hang closet storage, but the room is long enough that it wasn't needed for the shorter blouses and jackets. Instead, cabinets with doors were installed above the medium hang sections to hold folded items. Mission shaker door fronts in combination with chrome Bar handles balance modern and traditional, creating a transitional aesthetic for the cabinets. A closet hutch with a contrasting dark laminate countertop provides similar convenience and storage as a traditional closet island with drawers, but is better suited to the long, narrow space. It also breaks up the closet system, giving the eye a pleasant break from the all-encompassing white arrangement.